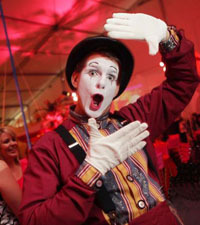 Enhance your next themed event with the addition of a talented mime. These unique and memorable entertainers can interact with guests or create a unique experience for any corporate event. They are the hit of the evening and leave your guests wanting more. Delight your audience with the subtle artistry of a mime. These talented entertainers can engage your guests with their physical presence and their sleight of hand. 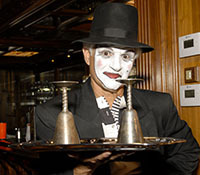 Whether you need a unique addition to a Mardi Gras party or just a splash of entertainment to set your elegant evening apart from the rest, a mime can be the perfect addition. Delight your audience with the interactive wit of these talented mimes. These performers can signature any corporate event by incorporating the brand name or trademark in their performance. 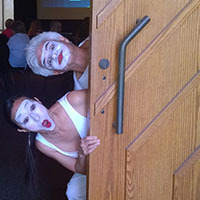 Whether you need a unique addition to a corporate event or a unique and interactive splash of entertainment, this mime duo provides a fun and memorable experience.